Members of the DCI Season Pass had access to more than 600 minutes of drum corps performances last Saturday when DCI.org broadcast the Coltrin & Associates DCI Southeastern Championship in Atlanta on the Internet. The Southeastern Championship represented the sixth major event this season that Drum Corps International has streamed live on the Season Pass. Previous streaming events included those in Lisle, Ill., Columbia, Mo., Indianapolis, Ind., Battle Creek, Mich., and San Antonio, Texas. DCI.org's Ricky Fritzsching runs the Web broadcast from the Georgia Dome television control center. Since DCI.org's first streaming attempt in June, the popularity of this feature among drum corps fans has grown. "More than 75 percent of our Season Pass members were watching the stream during the peak of the Southeastern Championship," said Ricky Fritzsching, Drum Corps International's senior Web producer. "That's an incredible number that speaks of the intense following and passion fans have for these drum corps." 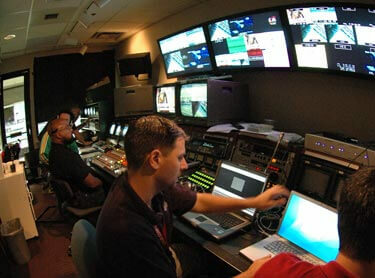 New in Atlanta, the Season Pass streaming video was broadcast in a multi-camera format, meaning that instead of a constant high-camera view, multiple wide and close-up shots were incorporated. "A big thank you to Tom Blair and the DCI TV crew for setting up the audio and multi-cam video feed that we used for the streaming," said Fritzsching. The remaining streamed events for the 2006 season will be of the 2006 World Championship Division II & III prelims on Tuesday, Aug. 8, and the Division I World Championship Semifinals on Friday, Aug. 11, from Camp Randall Stadium in Madison, Wis. The events will be shown in a multi-camera format. "We are very excited to add Tuesday's Division II & III event to our World Championships streaming schedule. This will be one of the first opportunities we have to show these corps in action, and we hope that many take advantage of this opportunity." said Fritzsching.